rec. 2018 Konzerthaus der Abtei Marienmünster, North Rhine-Westphalia, Germany. Shanghai-born, Italian-based pianist Jin Ju (b. 1976) appears here in volume 2 of her series of late Chopin works for MD&G. She has made other previous recordings for the label, including a disc of Schumann works and a collection of compositions by Beethoven, Czerny and Schubert. She first began drawing international notice early in this century when she was awarded prizes in the 2002 Tchaikovsky International Competition and 2003 Queen Elizabeth Competition. She went on to win first prize in a string of important though less well known piano competitions, including the China National and London-based Beethoven Society Competitions. She has performed with a number of major orchestras and at some of the most prestigious of the world’s concert venues but still strives for elbow room amid the plentiful competition from the many talented pianists from her generation. Perhaps this recording will help to give her separation from them. The Chopin Sonata No. 3 is in my view the finest of the composer’s three, and here it gets a very compelling performance. In the first movement Ju’s use of rubato is subtle, her dynamics always sensitive to the emotional flow of the music, her tempo choices well judged, and every other aspect of phrasing thoroughly convincing. She captures the shifting moods in the opening, from its resolute and stately grandeur to its quiet sense of mystery. The lyrical alternate theme is lovely here, Ms. Ju milking it for all its gentle yearnings and building passions, and for its undeniably love-struck emotions. The pianist chooses to play the exposition repeat, arguably a wise decision. Ju delivers a breathtaking account of the second movement: the outer sections are busy and full of brightness and energy, though with a sense of the feral and uncontrolled, while the middle section by contrast offers a serene, steady dignity. The third movement, marked Largo and paced judiciously here, comes across effectively in its intimate and mostly reassuring character. The finale is stormy and dark, filled with tension but also exhibiting boldness and defiance. She effectively captures the soul of this movement. Tempos here and throughout the sonata are well judged. This is a fine account of the Third Sonata, though it goes up against very stiff competition from Rubinstein, Cliburn and a host of others. Yet, she compares favorably with them. Incidentally, the timing in the album booklet and on the back cover of 37:14 for the sonata is wrong—it is 32:15, as I list it in the heading. In the other works here, Ju is dependably on target most of the time. Her Berceuse has a lovely dreaminess, while the ‘Minute Waltz’ is a deft mixture of energy and elegance. The third Waltz from the same set effervesces with playfulness and cheer and the Mazurkas are generally well played, none having a bad patch interpretively or technically. Yet, Ju can sometimes be a little fussy with her rubato: in the F minor Mazurka (curiously, not identified as Op.68, No.4 in the album materials), her little hesitations sometimes impede the flow of the music a bit. The slow tempo doesn’t help either. 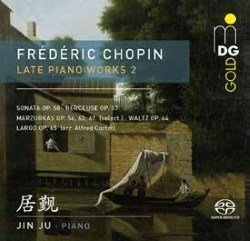 By the way, this darkly beautiful work was Chopin’s last composition. The Mazurka No.3 from Op.63 features the same kind of rubato phrasing at times, yet both performances still come across as tasteful and subtle, if a bit calculated. The Cortot transcription of the Largo from the cello sonata is a nice concluding piece here, the performance just fine. As for the sound reproduction on this disc, it is clear and well balanced. Overall, Ms. Ju turns in excellent work, especially in the sonata. That said, with the huge shadow of Rubinstein looming in Chopin’s music, and that of so many other Chopin players (for just one recent example, try Eugene Mursky’s splendid traversal of the Mazurkas on Profil), it’s difficult for any pianist to stand out in this repertory. In the end, one must assess that Jin Ju, for all her subtlety, technical skills, interpretive acumen and overall artistry, must be given high marks, but not quite the highest.